When Can You Buy an Expensive Briefcase for Work? We’ve talked about how a $9,000 handbag might be a bit much for an intern — but Reader E wonders when in your career women can buy expensive briefcases and work totes. How soon is too soon? I was wondering if you could do a post about expensive handbags for work. Kind of like the Hermes post, but a little bit of a different situation. I’m graduating law school this spring and will be working in a large law firm in the Fall. I want to purchase the Celine mini luggage bag with money I made as a summer associate, but I’m wondering if it’s inappropriate, since the bag costs around $2700. I’d get it in the plain black color. I don’t think it’s nearly as recognizable as the Birkin you discussed (I doubt most people know what it is), but it IS an expensive purchase for someone just starting their career. What do you think for a new associate? The only logo is a small imprint of Celine Paris on the front of the bag. She will have recently completed seven years of higher education. Congratulations! This is huge! Reader E should be thrilled, and I’m guessing her parents (and significant other if she has one) are thrilled right along with her. Gifts happen, and even if her parents or her SO were to buy her a Birkin (or a fancy watch, or the less expensive Celine), it’s an appropriate situation for a lavish gift. I suppose one could say that the Birkin-toting intern maybe got her bag for college graduation, but there just seems something more final (and adult) about law school/grad school graduation, at least to me. Also, a minor point: the bag Reader E wants to buy is large enough to be a briefcase and fit work papers inside it, which makes it more practical in a general sense (versus the 30cm Birkin, which as I understand it will not fit letter-size papers in it, let alone legal-size ones). So, for my $.02, those are the distinctions I would make between a law school graduate beginning her career, contemplating a briefcase/tote purchase, versus a summer intern, contemplating a handbag purchase. What do you think, ladies? When can you wear an expensive handbag — or watch — or pair of shoes — or piece of jewelry — to the office? When does such a thing hurt your credibility/professional reputation? Hm you’re totally right I just looked at my receipt. My mistake! I think the cross body is cute but only if you’re blair from atlantic-pacific can you really pull it off! I would hope that the prerequisite to purchasing this is, after she has paid off any debt (minus, arguably, student loans) and started an emergency fund. Agree. Add moving/set-up costs for her new job, too. I’d also caution to wait until she’s been working long enough to know what she wants in a bag. If she’s going to spluge, it should be on the right bag for her. it seems that she is splurging, so i wouldnt think there are any prerequisites. Many people i work with and went to school with splurged on expensive bags, shoes etc with bonuses — signing and yearly. In fact, Im a partner and still do this almost every year. Re-posting from late in the weekend to thank you all for your support re: my should-I-stay-or-should-I-go dilemma from late last week. After a lot of soul-searching, I got up early Saturday morning and went out and rented myself an apartment and came home and broke the news to the Mister. Turned out I didn’t have it in me to sneak around for a month, going with him to fun events and acting normal, then pull a Katie Holmes. I feel like I have definitely made the right decision and although it is and will be ridiculously hard, it is an incredible relief to just have the decision made. Thank you again for all your support, ladies. The Power of the Hive is something to behold! Which brings me to… oh my sweet baby Jesus I do love that python-and-black Celine pictured in the post!! So tempted to buy it for a separation present to myself!!! Congrats on making a decision and here’s to better things ahead! Your guy must have been SHOCKED! But kudo’s for having the gut’s to be doeing it! Mabye now your life will be alot better — I know mine was after I threw Alan’s dirty toothbrush out when he forgot it YAY!!!! Also, I threw out his dirty sock’s, b/c he alway’s left me (or the cleaneing lady) to do the laundry he had in the hamper. FOOEY on that and his little feet (that had a big smell) DOUBEL FOOEY! My father told me when I started working that I would look good with a big LIT BAG, and he was right. Now it does NOT cost $9000 (ouch), but it make’s me look very profesional when I take it to court. It is VERY big, so I can carry my lunch (and my purse) in it and NO ONE even know’s (other then me) what I am eateing that day. I also carry more of my GYM Clotheing in it so that I can go RIGHT to NYSC instead of haveing to go home, change, and THEN go work out. But since I am doeing so much walking on my FIT BIT, I am not at the NYSC every day any more. That is OK, but today, it is raining so I will ask my DAD if I can take the subway right to 86th and then NOT have to walk. Or mabye I just take the subway and get my steps on the ellyptical machine! YAY!!!! So I say to the ladies “GO FOR IT if you have the money, b/c you will look smart carrying something smart, like me. The men also will take you MORE serious if you look profesional like I do with my LIT BAG. I think the price range of the Celine is perfectly fine.. but I would disagree with the reader’s note that most people wouldn’t recognize the bag. At this point, the Luggage Tote is fairly recognizable. I’m not saying that’s a bad thing, but if the reader was looking for something discreet I don’t think this bag is it. I don’t know. I imagine that some people would, but I think most people in general don’t pay too much attention to designer brands. I know that the only times that I’ve ever heard of a Birkin bag were this site and that episode of Gilmore Girls where Logan bought Rory one, (and she was all “that’s nice, thanks” and everyone else was freaking out about it – I’m definitely Rory there). I’ve never even heard of Celine. Yes, I’d never heard of Celine until today, when the WSJ published an article about Flats being the trend for shoes this summer. Agreed. I recognize it from fashion blogs, but 99% of people you encounter in the professional world do not read fashion blogs. It wasn’t recognizable instantly to me either (though if I saw someone carrying it, I’d probably infer that it was a well-made and expensive bag, since it looks that way). I’m 25, live in a major metropolitan city, and would say that most of my friends (both locally and those in other big cities across the country) would recognize the bag pretty instantly. I like fashion quite a bit, and like to look at what handbag designs the fashion houses produce each season. I read tons of fashion blogs and magazines, and I recognize it, but I didn’t know it was called the luggage tote. In my head I just call it The Bag that Looks Like a Face. I never noticed that before! Big ol’ LOL! Celine is lesser known, but imo it’s as distinctive as a birkin or more. It’s a very unique shape. I’m also seeing it all over the blogosphere so I’d expect it to hit mainstream sooner than we think. I’m in my mid-twenties, live in a major metropolitan area, and if I’ve ever seen this bag before, I don’t remember it at all. My style is pretty classic, so I’m not surprised I don’t know anything about this bag. Maybe there is some safety in an expensive bag that’s trendy, since it’s primarily recognizable by other people who are interested in fashion (and presumably wouldn’t hold it against you? Unless they were jealous). Here I was thinking that the Celine was overexposed. It’s a lovely bag though. It’s both overexposed and overpriced. If you must spend over 1k on a handbag, buy a YSL Muse tote or something like that. It’s half the price of the Celine but will have at least twice the “in” lifespan. The faster a trend peaks, the faster it falls out of favor. The “blogger bun” is already almost gone. I think it’s going to look “last season” pretty soon. (Like the song “somebody I used to know,” it will be one of those trends I used to love). Are the name and the quirky shape (which you’ll probably tire of long before you can justify putting it in a closet) really worth the extra $1000? Is the quality and style really that much greater in a $2700 Celine than in a $700 bag? Personally, I really don’t like when my handbags look worn. I would much rather spread $2700 across several handbags than feel obligated to carry the one for 5-10 years. And then there are the ethical arguments… are you donating as much to charity as you’re spending on that bag? Or saving as much for your retirement? Think of someone you deeply respect as a “voice of reason.” For many people, that person is a grandparent. Can you imagine telling your grandmother how much you spent on that bag? Would she be proud of you for that? Lol! Oh Grandma! I am not going to have children because that is SUCH a luxury, to spend money on another human. But look at my new bag!!! FWIW, I’m just trying to talk some sense into the OP. I don’t suffer from retirement-busting bag lust, but I do have other vices. Like diamonds. And couches. I’ve spent most of the day dreaming of fabric for new curtains and pillows that costs $150/yard. And that’s the cheap one I found. One woman’s Celine bag is another woman’s couch or diamonds. And I don’t know that a ‘voice of reason’ or Grandman that would be any more proud of overpriced curtains or pillows than a handbag. I’m in my mid-20s and not particularly fashion obsessed or conscious and I’d recognize it instantly. I think its kind of the new Birkin in that it has a very distinctive look and is carried by tons of celebrities. That said, I agree that there is a huge difference between an intern carrying a $9,000 bag and a full-time associate carrying a $2,700 bag. Lots of associates have bags in the $2,000-$3,000 range and I don’t think people will find it inappropriate. I do agree with the financial advice to pay down student loans and build a nest egg first – you never how long a job will last or how long you’ll want to stay there. Personally I would not spend this kind of money on a bag (or anything else non-essential) as a new grad, but I don’t think it will affect you negatively at work. I would never spend that much on a bag. The reality is that your days at BigLaw are not infinite – most associates burn out within a few years. And it’s very hard to make the same kind of money anywhere besides BigLaw. Save the money and give yourself room to breathe and quit your job if you want. The other reality is that you don’t really make *that* much money as a first year even at the best of firms. It sounds like a lot, but it’s really just enough into to get you into the kind of trouble that happens when you’re just this side of rich, but still working for a paycheck. These are the folks that end up with an adjustable rate mortgage on a McMansion, a gazillion dollars in credit card debt, and basically live paycheck to paycheck when they could have been in good shape had they not succombed to delusions of financial grandeur. Oh, I totally agree and I personally would never spend that much on a bag either. I also would also rather replace bags more regularly so they stay looking nice and in good condition and I don’t believe a $2,700 will last 10 times as long as a $270 bag will. But I do know a lot of associates who have bags in that price range and I don’t think she would be judged to harshly by most people for it, assuming she’s not otherwise showing up dripping in diamonds and other obviously expensive things. Mid-twenties, relatively large metropolitan area, and I recognized it pretty instantaneously. While I might not know the exact cost of the bag off hand, I’d know it’s expensive. I do read fashion blogs frequently & try to stay up to date on trends, though. Go for it. I recently received as a gift from my husband a LV Alma PM in Damier. I’m very conscious of the fact that people will judge me for it (and of the LV hate that’s occasionally thrown around on this site). But I’ve been practicing for 5 years, as has my husband, the gift was for a milestone occasion, and I like my bag (!). Because it’s recognizable and people do have strong opinions about LV, I sometimes leave it at home in situations that call for ultra-conservatism. I think an expensive bag should wait until you’ve saved up enough money to cover the price tag of the bag by working your regular job while paying rent, making student loan payments and saving up for an emergency stash. For me that puts you right around the time of your first bonus. Agreed. It should go without saying that nobody should ever under any circumstances buy an expensive bag on credit. agree entirely. i used my first bonus to buy a leather tipped burberry trench. i used my second for a fancy bag. Honestly, I think she should wait 6 to 12 months. I’m still scarred by the 2008 recession—when first year lawyers were not secure in their jobs. I’m not convinced much has changed since. After 6 to 12 months, Reader E will have a better idea about her job and whether she even wants to stay in BigLaw long-term (I assume BigLaw because she was a summer and she’s making enough to consider this purchase). FWIW, I’d advise Reader E to continue living like a student, start paying off loans, and build a $10k emergency fund before splurging. The one exception to my “no splurging rule” is a 1st year buying a new car (not a luxury car) to replace an unreliable junker. Full disclosure: I purchased my first splurge item six months after starting my first law firm job when I got a substantial raise. Truth. I spent 9 months unemployed after being let go from my first BigLaw gig in 2008, and I wish I’d spent less/saved more during the time leading up to it. Agree. for me, it’s not about whether people will judge me for having an expensive bag, it’s what buying a $500 bag instead and leaving $2200 in a retirement account now will look like in 40 years. Although, it’s funny, I think if we were talking watches instead of purses, I wouldn’t see an issue. Then again, a watch is more permanent/less noticeable to others, so maybe that’s part of it. Agree with all of these points. From a financial/personal perspective, I would definitely wait 6 months to a year for any big splurge like this, especially because you really don’t know if you will hate your job and want to leave as soon as you can. I don’t, however, think you would be negatively judged by colleagues for carrying a $3,000 bag when you start. As a young professional who just graduated a few years ago, I can only imagine spending this much money on a bag if I had adquate emergency savings, was maxing out my retirement contributions, and had no other debt (other than student loans). I can get on board with the idea of splurging on a gift to myself, but if it were me I would wait at least 6-12 months like others said and feel out the job/new finances first. Absolutely. Maybe I’m just getting old– I was a new associate in the late 90s and I’m now in house, with two school age kids, a mortgage, etc. This just seems blatently stupid. I mean, buy something nice– you don’t need to wander around with vinyl or some uber sensible $100 purse. But this is simply out of line with what your salary, as large as it seems to you now. Just because you technically “have” that much money doesn’t mean it’s smart to part with it. I have like half a million in investments– should I buy a Ferrari? No because that would be stupid when I have kids to raise, a mortgage to pay, and a retirement to fund. The (paid in full) Lexus will do just fine. Portlandia, are you around? I was thinking about you and hoping you’re doing okay! Thank you for the concern! I broke down and told my best friend who was incredibly supportive about it. She visited me the past weekend and distracted me. My test results are still not back, but the anti-virals have made the current issue much better and I’ve been doing a lot of research about it and know it’s not the end of the world in terms of all the terrible things that could happen. I had been on two dates with a guy and I broke it off even though I like him because I’m too petrified to have this topic even come up in the next few months. but I am trying to move on and take it in stride. Glad you have some support and are working through it! There are some good materials out there that help with perspective, and that really got me through the initial shock. Things will work out fine. Can I just put a plug in for taking 15 minutes of resting your eyes at work? I just took advantage of my company’s “zen lounge” and I feel so much better! Didn’t fall asleep, just closed my eyes and did some deep breathing and I feel totally revived. That sounds amazing. I used to lay on the floor in a dark conference room for a few and it really made a difference. I just can’t find it in me to care about this issue–and I have given it some thought every time it comes up here. Judging someone for having expensive accessories reminds me of sumptuary law, and most of the other factors drawn in to aid in making this judgment seem either irrelevant or none of my business. Things that are important to know about co-workers will come out in other ways. +100 for reference to sumptuary laws! OMG THIS! I was reading through these comments and thinking wow?! I cant imagine people would judge (poorly, as opposed to maybe thinking, ohh, beautiful, I want that) for the bag you carry. Or suggest to someone that they are not in a position to buy a certain bag becuase they have not been working long enough or have enough cash in savings. Dont get me wrong, I like nice things and absolutly think appearances matter. many would even consider me a fashionista (at least in the legal world), but i cant imagine judging someone poorly for dressing nice or carrying an expensive bag. I agree that this is not something that should matter. But then I can’t help but think about that poster last week or the week before grousing about the 1st year associate with a cartier love bracelet. A bracelet! And, stuff like that comes up all the time from seemingly normal people. So, there is part of me that does want to be very, “why should this be anyone’s business but your own?” But another part of me always remembers how tricky starting your first job can be and how lasting first impressions can become in some circles (even if only in petty ones) and she still has to work with these people. I agree that it would be nice if we reserved judgment based on accessories though. I completely agree with this. Of course the ideal would be that you can buy/wear whatever you want, and none of your coworkers will judge you because clothing and accessories mean nothing compared to a person’s actual work ethic and ability. But that’s not reality. When you’re new in an office people make snap judgments about you because they don’t know enough yet about who you actually are. Everything you do will cause people to adjust their thinking. If you dress sloppy, people will think that you are lazy or don’t pay attention to detail. If you wear very expensive clothes or carry expensive bags, people may think that you value style over substance, that you come from money and don’t need to work as hard, that you have a rich husband and plan on working only until you have a baby (yes, as sad as it is, I’ve heard this exact thing said before), etc. I think there are two ways to go about it. If you are an introvert and don’t see yourself coming out of your shell for a while, then you probably need to tone down how you express yourself through your clothing and accessories. If you aren’t talking and socializing with your coworkers, then they won’t know much more about you than what you demonstrate through your personal style. You could turn off some people. However, if you are an extrovert and are putting yourself out there, people will get to know you. This means they will learn aspects of your character that are much more important than the image you project. If you’re an extrovert, buy yourself the bag, love it, own it, and make sure people know there’s more to you than just being a handbag afficionado. Buy it! I am a 50+ corporate executive and I am always impressed with my younger staff who have nice things. I look at the quality and condition/fit of their shoes, handbags/briefcases, watches and suits. I recognize quality and appreciate the investment, firmly believing that you should dress the part, and represent yourself as “already successful”. Like it or not – we are judged in first and second impressions by the quality of our appearance. For my daughter’s college graduation we gave her a gold and stainless Cartier Panther Watch and make no apologies for it. She wears it everyday. IT says she is quality and expect the very best from herself and others. The secret is not to talk about it. Don’t brag. When complimented – say thank you and nothing more. If you talk about the price, or how hard it was to decide to buy or what a crazy price it was, etc, you are pretentious. Too bad for those of us who didn’t have parents that could buy us nice things, huh? I’m pretty uncomfortable with the idea of young, fresh-out-of-school workers being judged by the quality of their accessories. Expecting them to dress professionally is one thing; judging them for not having a Cartier is quite another. Many of us graduate with barely enough money to buy a professional wardrobe and aren’t willing to go (further) into debt to buy things. Actually, your behavior says if you are “quality” and if you “expect the best from yourself and others” not a watch. Plenty of people can dress appropriately without having to have the “quality” you seem to think is necessary. Dressing as though you ‘re already successful means wearing an appropriate suit to an entry level job, not wearing St. Johns. For whatever it’s worth, I don’t think wearing a Cartier watch says (implicitly or explicitly) that you are quality and expect the best from yourself and others. I’ve known plenty of people who own Cartier watches and are neither of those things. Particularly, people who did not pay for their Cartier watches themselves. That said, maybe your daughter is quality, and expects the best from herself and others, and maybe people around her recognize it – but it’s probably not based on the worth of her watch. It’s probably based on her character and behavior. This. You can purchase a quality watch/bag/shoes; you can’t purchase quality character/work ethic/etc. Having one says little to nothing about whether or not you’ll have the other, too. Your daughter may very well have both, but there’s no correlation. And your comment makes me think it’s less likely that she does indeed have both. Oh come on, let’s not snark on her daughter who doesn’t even post here! Buying expensive watches is so middle class. “quality” people just have them waiting around for a good occasion. Your people buy quality watches; our people inherit them. I <3 these two comments. Your post says a lot about you. Not is a good way. Her watch says she has rich parents who buy her stuff. The posts from her mother say she is an insufferable snob who believes the quality of her character is based on the net worth of her parents. I would personally much rather hire someone who is self made. Does one need such a watch to make that statement? Holy cow that bag is gorgeous! I am of the opinion that you should buy what you want, when you want it, so long as you can afford it. If this means you’re an incoming first year associate with a $2700 bag, well, lucky you. I don’t think it’s any of my business how you spend your money. Also, I normally don’t notice bags/shoes/clothes in such a way that I could identify brand or cost. Thinking about all the women in my office, I can only identify one person that I would confidently say likes “expensive” items (not the same for the men – they are much more easily identified!). *eyeroll* If people at your work are judging you because of your handbag, they are insecure losers who are to be ignored. Buy what you want. When and how you buy your handbag is nobody’s business. Person I have been casually dating for about 5 months is on week 3 of a month long vacation abroad. He emailed after week 1 and that was the last I heard of him. My original plan was to let him be and not intiate contact. But now I miss him. I have this weird idea that if I reach out to him I will shift the power balance. Am I being silly? Will a short email really put all of my cards on the table? 5 months is a long time to casually date. Do you want to keep investing time in a relationship so casual you don’t feel comfortable sensing an email? Take a deep breath. If you miss him, send him a quick email asking how his vacay’s going. This does not mean you are asking him to marry you, or that you are putting all of your cards (what does that even mean?) on the table. Yes! I’ve personally had better luck (and more fun) dating when I tend to just say what I feel like saying and not worrying about whether its pushing the relationship somewhere. If you miss him, tell him. If that somehow freaks him out, then maybe its better to figure that out now. If you want to email him, email him. I don’t think that puts any cards on the table. And sorry to get all “he’s not that into you,” but your situation by contrast made me think of my parents, who have been happily married for decades. Apparently my dad was due to go to Europe for a few weeks right after they met, and he sent a postcard to my mom every day he was gone. And he is not a cheesy guy, but the message to me is that if someone cares, he’ll show it. Email him if you want. Why do men have to make all the effort? And in contrast to anon above some I know a couple who have been married for around 30years (happily). He was in the military and while away would be very rarely in contact. She didn’t know any different and was suprised when their peers disclosed they exchanged letters everyday. To them the seperation was for work, he went to work and focused all of his energy on that. I’m curious – has anyone ever known a particularly young/inexperienced man who had, say, a Rolex or a very expensive suit or briefcase? I never have, and, for men’s stuff, I certainly wouldn’t notice if he did (except maybe the Rolex, I don’t know men’s brands). I understand that this stuff is more noticable for women, but I’m curious whether it could go the same way for a man. I think that it could. I recall when I was a kid, we went to some event where my brother could get the autograph of a baseball player who was a big deal at the time, and my dad (after the fact) pointed out that the watch the player had been wearing cost more than our mini-van. Obviously that’s different, since he was known and probably pulling in millions (and our mini-van was probably dirt cheap), but I’m just thinking that this is something that men notice and comment on sometimes. I had a male law clerk who made a big deal out of the fact that he wore custom suits and had his tailor come into the office once to measure him. I probably wouldn’t have noticed if he didn’t point it out, but I wouldn’t recommend that sort of attitude for a newbie. On the other hand, I remember my (young) male colleagues in law school having a Rolex or something I could identify as nice and just thinking they must have generous parents–not a negative at all in my opinion. The guy in the $6,300 suit??? +1000000000 to all of you. I’ve seen a few entry-level male colleagues at my financial services firm wearing Ferragamo loafers, a Rolex watch, or carrying a Gucci wallet (not the obnoxiously obvious pattern, more subdued), etc… and also didn’t bat an eyelash. Like Statutesq, my first thought was generous family/graduation gift. Or, perhaps they bought it as a gift for themselves because they don’t have loans to pay off or live frugally in other areas and saved up for a while. I think what matters more than the item itself is the person’s attitude; if they aren’t bragging about their clothes & acessories or acting unprofessional in other ways, who cares? You are talking too much sense. Stop. A good friend of mine has 3 pairs of ferragamos…because his dad bought them and decided he didn’t like them. So he has thousands of dollars of hand-me-down shoes. Which he wears to his government sector job. OMG this reminds me of a guy years ago on a personal finance message board. He said he was in his 20s and he was obsessed with a $4,000 watch that he wanted to buy. He kept posting on the Living Below Your Means board and wanting that crowd’s blessing for the purchase because he thought it would be an “investment in his career.” You can imagine how that went down with the frugality people. Anyway, the consensus was that a multi-thousand-dollar watch on a junior person would be seen as pretentious rather than impressive. I used to read those boards every day for a few years & I remember that drama unfolding. Must be 7 or 8 years ago now. I still wonder whether he ever actually bought the watch or was just trying to get a reaction from the uber-frugal folks. I kind of think that women seem to judge each other more for these things than we do men or other men do at all. I do think some men notice and make comments. My male boss has made some (unfunny) comments about how clearly since I have so many clothes and dress well, he’s paying me too much. He has also asked me how much I’ve paid for certain bags or accessories, which obviously makes me super uncomfortable. I think men probably don’t notice at the same rate as women, but if they do, are likely to make similar judgments. I wonder how many of the men (or women) criticizing the price of designer clothes/accessories drive super expensive cars. Or take lavish vacations. Or have some other expensive hobby. As many have said above, if you aren’t running up unnecessary credit card debt or robbing a bank to indulge yourself, it’s your choice how you spend your money! “I want to wear a Rolex watch/Hermes tie/Prada loafers to work but I’m afraid that it won’t be appropriate” said no man, ever. Funny story – I got my husband a new portfolio to take to meetings – his other one was really beat up. He won’t take it to all meetings because it is “too nice”! Agreed. This is the sort of thing that one can REALLY overthink. Admittedly, I still haven’t bought the expensive but recognizable bag that I really want (Prada Saffiano tote) because I work in an office of fashion-obsessed dudes who will certainly comment on it (the degree of flack I get over the fact that I wear a man’s watch is RIDICULOUS), but unless you are in an environment like mine, I say go for it. In fact, I’m on the verge of going for it, regardless of the fact that we’ll have to have EXTENSIVE discussions regarding all of their opinions about it. I love that bag! Dooooo it! I am of the opinion expressed throughout this thread that its pretty sad that people are judged by this. If she has the money to buy it responsibly (or whatever that means), why not. I don’t think it says anything (good or bad) about her character, her work ethic or the way she expects to be treated. It says something about her personal style. That’s all. Do it. They would just comment because men wish they could carry manbags/murses! Go for the Prada Saffiano tote! I just finally splurged on it (first big splurge) and love it. So classy and functional. A guy in my elevator bank used to wear Prada loafers. In my town, that is pretty noticeable; I’m not sure you can buy them without jumping on a plane to somewhere else. To me, it screamed “I am dressed by the woman in my life.” I think he was a casualty of the recession. I think I’d swear off of noticeably pricey things until I’m sure that I won’t be wearing them in the breadlines. And if you can’t pay cash, wait until you can. Guys in my high school used to wear Prada loafers all the time, it was no big deal. Guys in my high school used to make jokes about the Pope wearing Prada loafers all the time, it was no big deal. Most guys don’t splurge on fancy clothing and accessories. They splurge on TVs/gaming consoles/other media stuff, cars, and other boy-toys. Does a man get judged by other men? Yes, and he gets teased about his 52″ TV and sporty BMW. Would a first-year male attorney get teased for a $4k watch like they would a $50,000 car? I wouldn’t be surprised. My man has said it about himself and others. Disagree. I bought my husband a nice designer laptop bag without ostentatious logos or other branding. I bought it because it was higher quality and would last longer than cheap bags, based on my experiencw with the brand. He was embarrassed to carry it to work because it would remind his colleagues that we are more financially secure than they are. Related TJ: How many bags do you have? How many do you want? I have 3 that I love right now- all leather, one brown, one black, and one red. I have several I don’t love that I plan to get rid of soon. The ones I love are all close to the same size (tote for work– fit necessities but would need a sep bag for lunch/gym). So if I were to expand my collection I might get a bigger bag but wouldn’t need it to be as nice (since it’s for lunch/gym). Carrying 2 bags at once seems so weird though! What do you think? #1 Black leather satchel for daily carry (year-round). #2 Black small leather cross-body (gets use maybe 3-4 times a year). #3 Satin clutch for formal events. #4 Black nylon satchel (MZ Wallace) in case I’m traveling somewhere that I’d rather not bring my nice leather bag to. When #1 gives out, I’ll replace it with a new #1, and so forth. I have two “investment piece” bags for work: good quality leather totes in classic shapes and colors (black and tan). Two casual cross-body styles for the weekend that I spent considerably less on: both leather, in grey and red. 5 clutches/small bags of varying sizes, colors, and dressiness. Didn’t spend much on either of these, I think max $100 for a cute Kate Spade clutch on super-sale. If I were to purchase any more bags, they would definitely fall into the “investment”/work bag category. I use these every day and sometimes don’t switch bags for the weekend. I make every effort to keep my purses in good condition, so any additional purchases would be new styles/colors rather than replacing something, and likely to mark a milestone (for example, my most recent purchase was a Mulberry Bayswater bag last year to celebrate getting a new job). FWIW, I don’t think it’s weird to carry two bags at once. I use a Longchamp Le Pliage tote that I’ve had for over 5 years to carry my gym clothes and lunch to/from work, in addition to my leather handbag that holds everything else. I commute via public transportation and have never found it cumbersome to have two bags. I think it’s weird to have the same stuff spread across two bags. In the system you describe (which lots of people do, I think), you have the work stuff in one bag and the extra stuff in another, which gets tucked away while you’re working. I have a regular bag – tote or hobo that I rotate – and then a giant totebag for files that I do NOT rotate. So I carry 2 bags to work every day. The regular bag right now is an old brown Coach one, no logo, going to retire soon with change of seasons and go back to snake print Cole Haan or green Kate Spade for summer. I have 2 other winter bags (both cole haan) that I don’t really like (too heavy) and should get rid of. The tote bag is Michael Michael Kors, red. I also have a non-work bag for weekends/mom duty – right now it is a plaid Boden flannel tote. In summer I use an old J Crew canvas thick cotton one. I’d say I’m pretty set for bags right now. I’ve got four work-appropriate totes (brown leather, cognac leather, black pleather, and a red Pliage); one quirky tote (blue pleather with cloud/flower appliques); and six smaller bags for errand-running and/or nights out (purple leather, navy leather, black leather, brown leather, black sequins, beaded). In heavy rotation, I have a black nylon cross-body tote for day/work/gym/schlepping about town, a black python tote (the handles kind of remind me of the Celine bags), and a cross-body gold envelope-style bag that can be converted to a clutch. I would really like to get a good tan leather tote for spring/summer that holds everything. They were expensive, but I never buy, or even look at, handbags anymore. Love them all. And I’ve had some of them for more than 10 years. I think she should carry whatever damned bag makes her happy. As reading this website has drilled into me, no matter what you do, haters gon’ hate. I understand we need to be careful about how we’re perceived, but singling out a bag seems very silly. My husband got me a LV instead of a ring for our wedding. Metals have been ridiculously high priced for the past year, and frankly, making the choice between a cheap ring or a really awesome bag was easy for me. No one would have judged me for getting a simple platinum band, even if it cost more, but I prefer my bag. The bag-as-wedding-ring might be a little unusual, but the point is, you don’t ever know another person’s values or priorities. Even with the Birkin, which is a little extreme- sure it cost about the same as a small car, but I know a lot of people who say they need cars, but I would disagree and classify that as luxury. I find I get more joy out of an unexpected luxury than I do out of the expensive “necessities” that most people blow money on without thinking too hard. Walking and then taking the bus instead of taking the metro quickly becomes second nature, not to mention a very healthy habit, and has saved me the price of an LV in less than a year. Should people act according to my assumptions if I believe that everyone who uses the metro doesn’t need their paycheck very much? Or everyone that gets their hair colored? We need to keep the discussion focused on existing perceptions by those who could affect our career, which isn’t something we can reduce to strict rules. Use common sense but let’s not perpetuate the idea that everyone ought to have the same priorities. We already have to be so careful and conformist with clothes. Refraining from owning or using a luxury item that is practical (we’re going to carry some sort of bag) strike me as really sad and inauthentic. Bag-as-wedding-ring is only unusual if at your wedding ceremony he slipped the bag on your shoulder. With this bag I thee wed. It wasn’t part of the ceremony. He did make a big deal out of presenting it to me though, because he wanted it to have sentimental value. If anyone is ever lost for a metaphor comparing bags to a relationship, LMK, I got lots, lol. I definitely agree that all values are relative. People always make comments about my apartment, which is in a generally high cost area. What they don’t realize is that I prioritize the location and save in other ways. I have no subway/transportation costs, cook all meals and never go out for lunch/order in dinner, don’t drink alcohol in restaurants, don’t frequent coffee shops, spend very little on makeup and hair products, don’t color my hair, don’t have a tv or cable, etc. This set up makes me happy, but I realize that another person with different priorities would find the same lifestyle unsatisfying. To each their own. Agree. I am a young partner at a biglaw firm in the midwest. I drive a luxury brand car that has an MSRP of $65,000. At first, I was extremely self conscious about it and what people would think of me. But the reality is that (1) I bought it used, for $10,000 less than my husband’s Ford cost and for less than half the MSRP, I will drive it for a decade if it keeps running, and it was a very sound financial decision; (2) it had what I needed/wanted in a car standard; and (3) I drive something like 20,000 a year, and thus I prioritize a car differently than other people–I live in a modest house, don’t own a single bag that I paid more than $400 for (and only one 1 of those), wear moderately priced clothes, etc. ; but I’m in my car for a couple hours a day, every day, and I like the feeling of safety and convenience in this car. Someone who can walk to the office can and should prioritize differently. So finally I decided that, F$%* it, why do I care at all what someone else thinks of my car? I guess the difference between me and Reader E is that I’ve already proven my competence, but I certainly wouldn’t begrudge her the right to prove hers just because she’s carrying a $2700 bag (which I wouldn’t recognize anyway). I would wait on the bag more for the financial security reasons but that’s my own value set being posed Reader E. I wouldn’t think anything about a single (or few) luxury items on new young professional. If I noticed, I would probably assume “generous parents” or “gift” and think “lucky them”. No snarkiness implied. Where I will admit to raising an eyebrow is when a newer employee (note that I’m not in law) is constantly dressed head to toe in designer shoes, clothes, accessories, drives the luxury vehicle, etc. I don’t work in a company where people outside of the executive offices/senior management could “afford” to do that. Then I assume she is either in massive debt OR that she is still being floated by her parents. Many times it becomes obvious it’s the latter (multiple comments about the parents in conversation, etc) at which point–as someone who prides herself on independence–it’s hard to fully respect that person. I’m not going to treat them any differently from a professional standpoint but I am going to have a hard time relating on other levels. Again, my own honest outlook there based on experience and personal values system. Query: What if the person had a successful business prior to working for your company? What if the person made smart investments when they were younger and had, say, a whole bunch of rental properties that made them money. Or had been a child actor and made money that way. There are other options other than: parents or debt. Some people could have made money by working for it. Absolutely; I was just noting the most common assumptions and things that I have personally come across. In my own experience/observations it’s been individuals right out of undergrad making $30,000-$40,000/yr and were not coming off of other business ventures. I’m a recent grad making $30,000-40,000 a year who is gifted nice things by my parents. Certainly not $2700 handbags, but still much more than I could afford on my own. My parents have worked hard to manage their money and know that they have plenty for retirement. The way they frame the gifts and assistance is that I’m getting my inheritance now. The gifts really aren’t that lavish, but that’s the concept. They enjoy seeing their hard work make a difference in my life, and they know that the gifts and vacations are making a much bigger difference in my life now than they will by the time my parents pass away (because, God willing that they maintain good health and I stay on a good path professionally, by that time I should be able to afford those things for myself). While I don’t flaunt my parents’ support, I also don’t make an effort to hide it. Like you, I pride myself on independence, and having my coworkers’ respect means a lot to me. I don’t want them to think I’m financially irresponsible and wonder if I’m going into debt to pay for the gifts and vacations. I prefer for them to know the truth— that I’m responsible with the (small amount of) money I make and am grateful for my family’s generosity. Topics like this make me nervous! I wear the same (very nice) jewelry every day and it has all been gifted to me by family members and all has really really sentimental value. I’d hate to think that people are judging me for wearing my mom’s rolex, given to her by her parents when she graduated law school and given to me when I graduated law school, or my grandma’s cartier “nail” bracelet, given to her by my grandpa after many years of marriage because their relationship was strong as a nail and given to me on my wedding day. As a sidenote, the stories behind my jewelry are part of the reason why going forward I want to move away from “fast fashion” that falls apart after a season and invest in fewer high quality timeless pieces that hopefully I can give my daughters/granddaughters/etc. one day. I love stories like these! Don’t discount the fun designs which are totally ‘of their time’ – these have turned out to be my favorite things from my mum’s old wardrobe ! Here’s one thing that popped into my head: who is going to judge us for the $2,700 handbag? I think the honest answer is other women. I don’t think men care. My point isn’t that women should be more like men, but we worry about these things constantly, and maybe it would be time well spent to simply not judge other women in the first place. My two cents. A better question might be, WHY would you want to waste $9K on an expensive handbag, regardless of your job title or status? I can think of far better things to spend it on than something so self-indulgent. Can anyone recommend a (much) cheaper line of bags that looks like Anya Hindmarch’s? I love the look of those bags, but not the price. I’d like to spend under $300. I have 3 Anya Hindmarch bags and they are amazing. Each of them has cost less than $350 from either the official Anya Hindmarch website on sale or from theoutnet.com. The Outnet just had an Anya sale a couple of weeks ago so there might still be a few discounted bags on the US site. If not, I would save your money and wait for the next sale. I have at least 4 purses of varying sizes that I justified buying that sit in my closet so I tend to advise against a splurge purse unless you know you’ll use the h3ll out of it. The purse I use most is a cognac Fossil crossbody I bought on sale 2 years ago. Second most is a Franklin Covey laptop bag in maroon patent. My sister will buy nice bags and not think twice about it so YMMV. I also think I’m in a much lower pricepoint than many of the other ‘r3tt3s so sometimes I feel like a country mouse reading about people’s experiences. Me too :) Country mice unite! Please forgive me if this comes off as rude, but the question of “too expensive for a law firm” seems silly. If an item is otherwise appropriate for the office, why does the price tag matter? If you’re an heiress, good for you. If a bag is within your budget, good for you. If you’ve dined on ramen noodles for a year and sold your blood plasma to afford the bag, well then, good for you. This conversation reminds me a bit of the advice girls used to get about not seeming too smart in class. Now we’re coaching women not to appear too successful? It can be hard to cleverly deal with questions from colleagues (especially when you are new and other new colleagues have a very good sense of your starting salary) about the price of an expensive purchase. Someone asked me whether I paid cash or got a loan for the brand new car I purchased between graduation and starting at my firm. I told him I got a car loan and a few minutes later he announced to our entire start group that, by his calculations, I was working 17 days per month just to drive my car. There absolutely was judging going on, whether that was fair or not. This was 19 years ago and I still vividly remember how silly I felt at that moment. That person could not have been very mature….SMH. We *are* coaching them to be successful. And who wants to detract from that with something like a bag, the presence of which may scream (in some offices) that the person’s judgment may be off? I say this as someone who has been working at BigLaw for a long time. I think of it as being like an NFL linebacker — use it to set yourself up for the rest of your life, b/c it likely won’t last. A nice item, if the rest of your house is in order, is OK though. Everyone above you on the food chain has an opinion of you and you don’t want be the one who lets her accessories work against her. Stupid? Yes. But if if someone has the $ and wants to spend it, she should know if her accessories are going to work for or against her (or just blend into the background, which is probably what the poster wants). It’s not just know-your-office, it’s know-your-situation (so it might pass muster in your office, but if you have to charge the bag or finance the Porsche, it probably just isn’t a wise purchase for you anyway). And clients — they really don’t want to see lawyers with fancy toys. They pay us too much already (they think) and really don’t need to see things that reinforce that. Maybe different if you only deal with people who carry something pricier and / or more noticeable, but that’s likely to be rare. It’s one thing for an item to whisper “I’m expensive,” but it’s another to shout it. By the way, am I the only one who sees a face in the Celine Luggage tote? You’re not alone! One of my fashion bloggers calls it the “robot face” – http://www.wendyslookbook.com/2012/05/olive-leopard-spots-celine-luggage-micro. Does anyone have a bag they recommend for carrying a laptop, cords, notebook, lunch and coffee cup? I feel like a crazy lady going to work with my lunch bag, my laptop bag, my purse and my pump bag every day…. Would love to downsize my bags! Honestly, I love my LV Neverfull for this purpose. MK also makes a nice version of it. I don’t like carrying a laptop (because they’re heavy) but a macbook pro + cords fits. I just don’t know that all would fit together. I also started bringing lots of food at the beginning of the week so I don’t have to haul a lot everyday. clean eating takes up a lot of space! 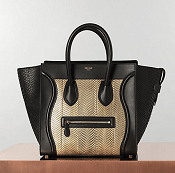 I would love to carry around a Celine or a Hermes – but what about a financial plan? Retirement? And most importantly to me, piece of mind. I’m a 30-year old associate in big law and have a $1m + networth now due to frugality, good investing, and a like-minded husband, and I still can’t allow myself to purchase a Celine bag, even though I love it. I think I would need a net worth of at least $6m to feel like I could spend that much on a purse. For now, I am okay with an understated leatehr coach bag. In my experience, your best bet is to dress to your salary level. If you have a great salary that permits you to buy Vuitton and Chanel, go for it. You are at that point identifying yourself as someone who is valued by the firm and compensated accordingly. But, if you work in a more mid-range firm, displaying obviously expensive items may confuse other’s perception of you. You could be inaccurately envied as earning far more than your peers, which can lead to conflict, or worse, judged as being married to or a scion of wealth, and thus not as committed to your career. I know, I know, it isn’t suppposed to be that way. But we are talking human nature here, and whoever said that was logical or fair. It’s a very tough line to walk. When I was in law school, I (along w/ a friend/classmate) received an award from a bar association that was presented at their annual meeting. The group was nice enough to pay for our travel, accommodations, meals & to provide us with tickets to all of their events during the meeting. As first years, we had to scramble to come up with enough decent clothing for an event like that. They covered our cost to their annual meeting the following year & by that time we had acquired more professional wardrobe pieces by virtue of working & interviewing. I guess the change was noticeable because our assigned mentor told us that some women in the group had commented that we had become clotheshorses. It was utterly ridiculous since I recall during that period we both were on tight budgets & couldn’t afford to spend more than around $100 on an outfit (usually brands like Kasper, Jones NY & Tahari) & they were usually bought on sale at department stores. $9,000 is a big number for every women. I hope some one who spent more that $9,000 to shop a bag that can daily use, not just like a mini bag or luggage. I think you can choose a high quality replica bag, this is another option. You can saving 90% to get a high quality bag at macybags dot com. Hope this is information will help you to find a dream bag.